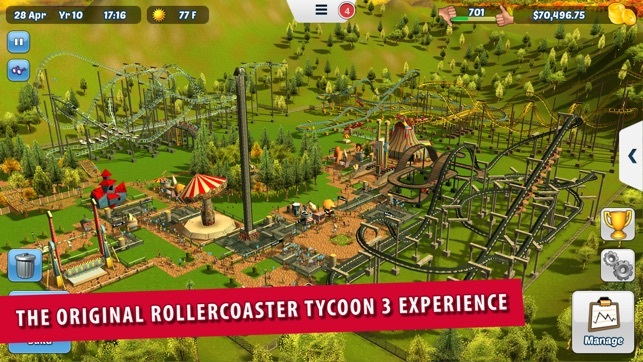 RollerCoaster Tycoon® 3 (RCT3) is the classic bestselling PC strategy simulation that now brings the fun of a roller coaster park right to your iPhone or iPad! With a new mobile-friendly UI, the creativity, depth and sophistication of the classic PC game is all here - with NO in-app purchases. 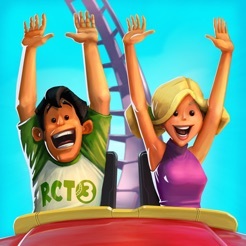 · Create your ultimate theme park in stunning 3D! · Let your imagination run free in Sandbox mode. 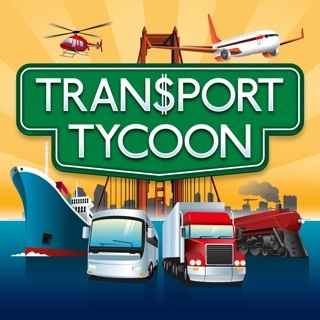 · Play through all 18 scenarios from the original PC game. 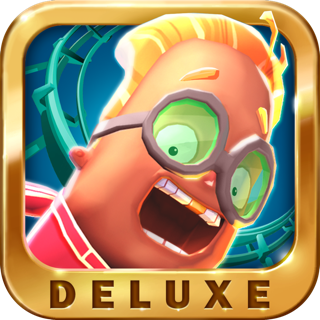 · Watch your guests react to your park as you try to make them happy. 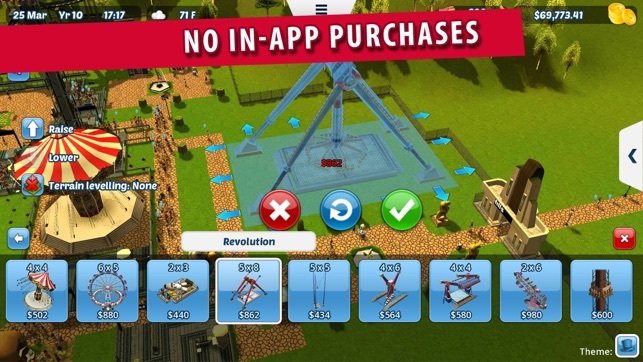 · Happy guests earn you more in-game money to build out your parks even more. 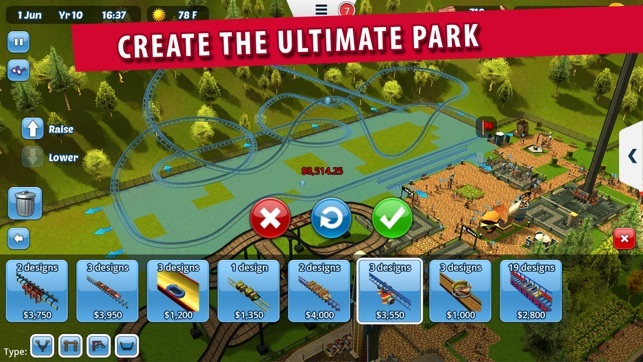 · Design your parks using 5 fun themes: Generic, Spooky, Western, Adventure and Sci-fi. · See every spine tingling detail with fully controllable cameras. 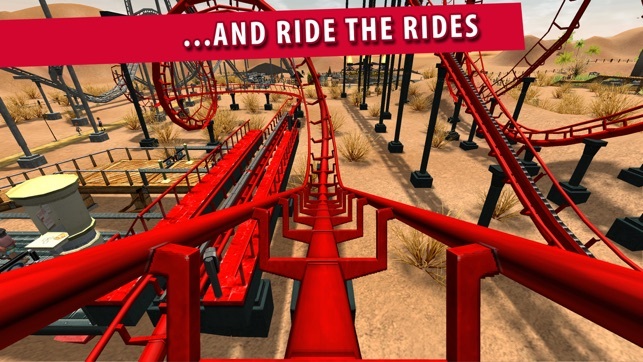 · Grab a front seat for the ride of your life with the jaw-dropping Coaster Cam. Fix for crash when running on iOS 9.3. Impossible de jouer une part c'est beaucoup trop saccadé sur l'ipad air 2!!! Requires iOS 7.0 or later. Compatible with iPhone 5s, iPhone 6, iPhone 6 Plus, iPhone 6s, iPhone 6s Plus, iPhone SE, iPhone 7, iPhone 7 Plus, iPhone 8, iPhone 8 Plus, iPhone X, iPhone XS, iPhone XS Max, iPhone XR, iPad Air, iPad Air Wi-Fi + Cellular, iPad mini 2, iPad mini 2 Wi-Fi + Cellular, iPad Air 2, iPad Air 2 Wi-Fi + Cellular, iPad mini 3, iPad mini 3 Wi-Fi + Cellular, iPad mini 4, iPad mini 4 Wi-Fi + Cellular, 12.9-inch iPad Pro, 12.9-inch iPad Pro Wi-Fi + Cellular, 9.7-inch iPad Pro, 9.7-inch iPad Pro Wi-Fi + Cellular, iPad Wi-Fi (5th generation), iPad Wi-Fi + Cellular (5th generation), 12.9-inch iPad Pro (2nd generation), 12.9-inch iPad Pro Wi‑Fi + Cellular (2nd generation), 10.5-inch iPad Pro, 10.5-inch iPad Pro Wi‑Fi + Cellular, iPad (6th generation), iPad Wi-Fi + Cellular (6th generation), iPad Pro (11-inch), iPad Pro (11-inch)Wi-Fi + Cellular, iPad Pro (12.9-inch) (3rd generation), iPad Pro (12.9-inch) (3rd generation) Wi-Fi + Cellular, iPad mini (5th generation), iPad mini (5th generation) Wi-Fi + Cellular, iPad Air (3rd generation), iPad Air (3rd generation) Wi-Fi + Cellular and iPod touch (6th generation).